Working on the crewel rooster project is actually really fun, despite the oscillating ideas along the way that prompt me to tear out and replace a lot of the embroidery. Well, here’s a stage in the project where I didn’t take anything out! 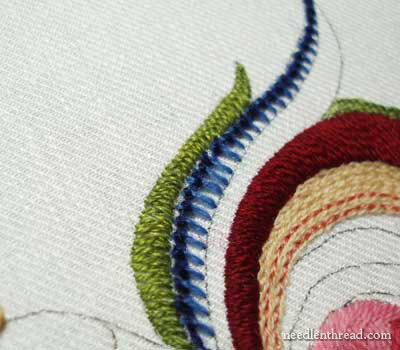 The tail has been the best part of this crewel embroidery project, because it opens up a lot of possibilities for variety in stitches and color and thread. So the tail has been great fun to embroider! There are elements that need to come out as yet, but we’ll get to that later. Resting on the top of the largest tail feather is a little feather that flips out behind the large one. I stitched this in buttonhole stitch, in green, using Gumnut Poppies. 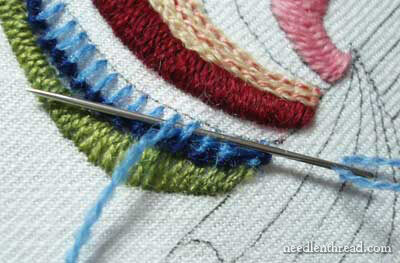 I lined the top of the buttonhole stitching with stem stitch, to close in the feather. Then I moved on to the large feather between the largest brick-red satin stitched feather and the green basket stitch feather, which I showed you the other day. I began the top of this middle feather with straight stitches evenly spaced, over which I intended to work a ribbed backstitch. This is the same concept as working a ribbed spider web wheel. 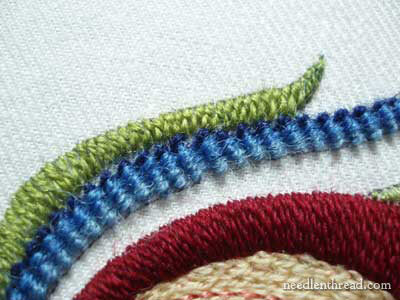 After working a dark blue line, I took a medium blue, and began backstitching over the bars – it’s an “under-two-back-over-one” stitching rhythm that basically wraps each of the bars with a loop of the thread. I worked one row of very dark blue, two rows of medium blue and one row of light blue in this manner over the bars. And this is what I came out with. There it is, from afar. 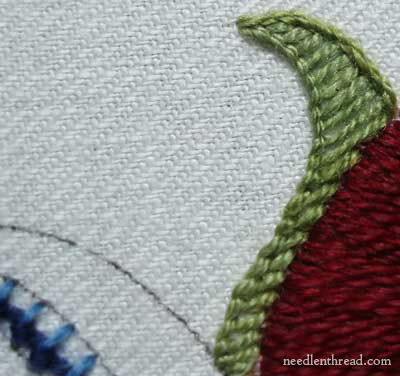 Then I worked the base of the feather in long and short stitch, lighter at the tip and darker towards the rooster. The difficulty was that I didn’t have any shade between the medium and this very dark blue, to cut the transition and make it a bit smoother. Ah well, we work with what we have! And this actually doesn’t bother me too much. I’m sure it will stay in. Some things that will change, though, before the rooster is entirely finished: 1. The lowest feather on the tail – in the shades of pink – will be cut out and replaced, and I’m pretty sure the middle large brick-red satin stitched feather will be re-worked. I didn’t pad that, and the threads in the middle of the feather at the widest part are starting to look discombobulated. I’m not satisfied with that, so eventually I’ll re-stitch it and pad the satin stitches thoroughly. Feel free to add your questions, comments, or suggestions below! OMG – I love, LOVE the blue 'feathers' and the new little green feather on the tail. Your rooster is looking quite regal! Ooooh, I love the blue section! It's coming along! I know I'm jumping the gun here, but any plans for this piece when it's finished? Wow, he is really coming to life. De Colores! Ooh, I love the blue! This is going to come out really nice. That blue feather is my favorite. I love the color and texture. The pinkish bottom feather doesn't seem to fit in now. I'm anxious to see what plans you have for it later. It looks lovely so far! I love how you don't seem to mind trying something out and taking it out again if you don't like it, I do that a lot too and people often say I'm crazy because of it xD But sometimes you just need to try something out and you'll see how it ends up. It's exciting! Good call on the stitch direction onafixedincome. I agree. If you redo the red feather, how about overcast stitch down the middle in the same red as the waddle, the lighter color,and do padded satin stich in the brick red on either side(changing the stitch direction). I love the green and blue feathers. Good work Mary. Thank you to share your ideas and work with us, it is very interesting. 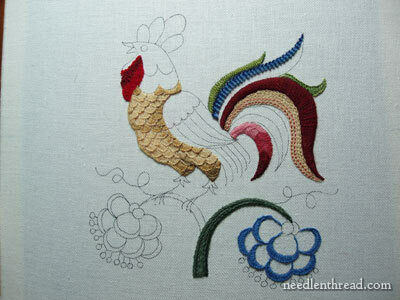 I like to follow "the rooster story"
I just love the way this fellow is coming along! Very nice. This rooster rocks! 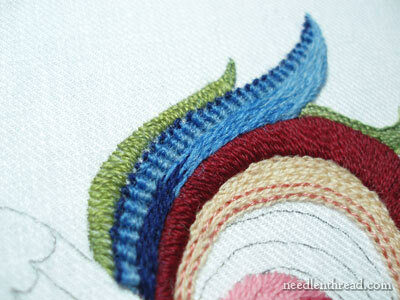 Next Next post: Crewel Tail – Over For Now!